Whether it all about iOS or Android app development, it takes a lot of efforts and resource to build an enterprise mobility app and it's a crucial step to measure success and failure involved in doing so. A simple mistake can lead you to a major downfall. However, if you initiate your enterprise app development planning accomplished with certain strategies, it might help you to avoid failure. First of all, it’s important for you to know your requirements first. Be clear, what is the app problem that you need to solve. The major benefits of having enterprise apps are, it offers streamlined processes and increased mobility. Be confident if your infrastructure can support concurrent users without it crashing. Make full proof plans for both the back end and front end. It is crucial for the app to cope with the amount of data required to send it, even if signals are reduced, as well support all devices connected. Development planning process of a good enterprise app ensures delivery benefits. In order to build a revolutionize enterprise, it’s not always necessary to build a behemoth app as it can resist data and mobile processes, end up failing. Thus, when planning to build an enterprise app, think agile. Prioritise each and every functionality of the app. Moreover, small apps are faster to develop, along with higher adoption rates. 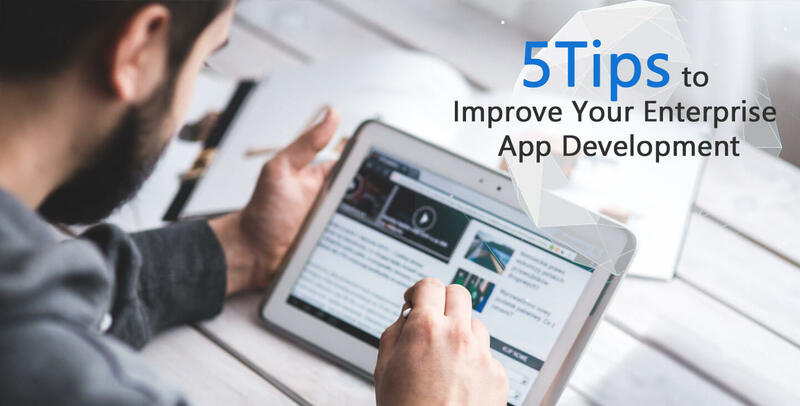 Here in this blog, here are 5 tips that help to improve enterprise app development. As we understand, building an app and how everyone can use it are two different aspects. It's crucial to figure out, how the app will fit onto each device and manage app version control, OS version control. For this, there are plenty of MDM (mobile device management) tools. MDM makes sense, ensuring standardize security settings and control fleet in an efficient manner. It's ok when you are working with data, but what if there's no signal? In such case, having a signal loss feature into the app improves user’s trust and enhances the effectiveness of the app. This is really helpful. Using device data caching at the data processing can be done. It’s tempting to make the app’s heavy lifting be done server-side, however at the certain point it's not possible to implement. Considering user's prospect is necessary. And for this an agile development methodology needs to be adopted, so that feedback loops can be executed in the development process. Now, with the feedbacks, making prioritize becomes easy. The user's feedback helps to maximize your return on investment by offering the exact requirement of the users. Well, no-one will want to compromise on their credentials, but every time it's not possible. In this advanced technology era hacking and data loss is quite common. For instance; enforcing MDM can ensure strong passwords to access the device. The detailed planning process is the essential element while executing any app development. Bespoke enterprise app development can be a big, expensive project and headache for development teams. We at Root Info Solutions holds massive experience in budget-friendly planning, designing and developing tools. With experienced development team, we are confident to transform business processes and increase productivity leveraging out-of-the-box idea and cutting-edge technology.